About a week ago a man (he had a Welsh accent) phoned our curator seeking information about the ancestors of a Thomas Cummings who married a lady called Ann or Anne. It was unfortunate for this chap that our curator was on the verge of setting off to his daughter’s wedding – taking his daughter with him, of course. I’m afraid we didn’t even get the man’s phone number. 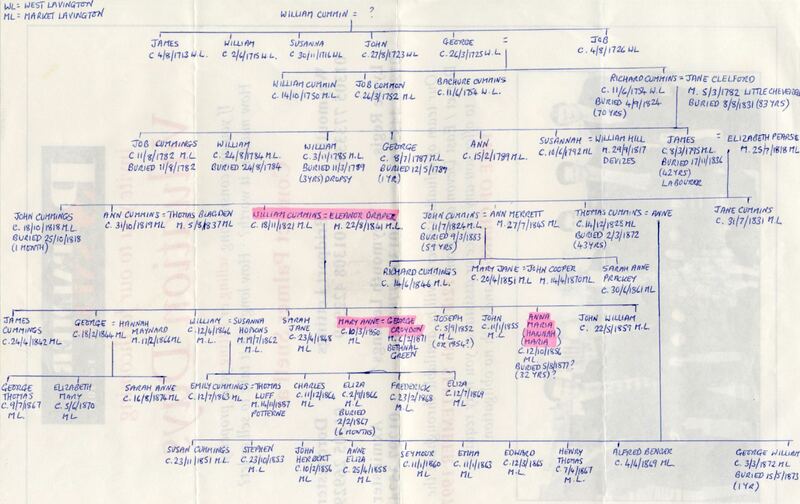 But our curator has now looked through the records at the museum and has found a Cummings family tree. This was among items which had been former curator, Peggy Gye’s personal papers. It was not an accessioned museum item. It’s a hand written tree, sent by another researcher, probably about 15 years ago. It is shown below and can be clicked to see a much larger version. If our phone correspondant sees this then he’ll find his Thomas and Anne along with his parents from Market Lavington, grandparents, great grandfather and a great great grandfather who were probably from West Lavington. there is a mistake in this family tree. My maternal gr.gr.grandpa William Cummings,born in 1821 Market Lavington, married twice. Firstly Eleanor Draper in 1841 as is shown. She died in 1862 and William married 2ndly Susanna Hopkins in July of 1862. The tree wrongly shows his son William on the next line down born in 1846 as marrying Susanna Hopkins. As can be seen from census returns and parish registers Emily,Charles,Eliza anf Frederick are all children by William’s 2nd marriage and should appear on the line above next to John William bn 1859. We’d like to thank Clive for this. The image showing through from the back of the paper is not relevant. It’s an estate agent advert from Weymouth. This document could help others researching the Cummings family in the Lavington area as well. This entry was posted on March 4, 2012 at 6:16 am and is filed under Museum. You can follow any responses to this entry through the RSS 2.0 feed. You can leave a response, or trackback from your own site. Hello, I also have a correction. I am also descended from William Cummings (1821) and Susannah Hopkins. After Eliza there should be three more daughters, Kate born 1872 (My great-great grandmother) Martha, born 1875, and Florence born 1878. Many thanks for this amazing tree! Thanks so much Zoe. The world is full of wonderful people, like you, who are willing to help our museum and make us feel good at the same time with lovely comments. Hi, I have just been looking through some old certificates and found the death certificate of my Great Grandmother Martha Noyce maiden name Cummings who was born at West Lavington November 4th 1874.